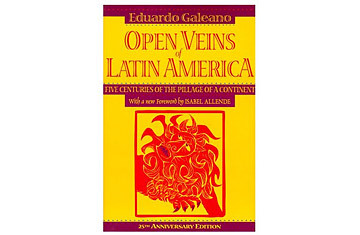 On Saturday, April 18, Venezuelan President Hugo Chavez publicly handed President Obama a copy of Eduardo Galeano's seminal left-leaning tome on the foreign exploitation of Latin America. By Monday, April 20, the book  first published in 1971  had skyrocketed to #2 on Amazon.com's bestseller list. It seems as though the Venezuelan leader, a shrewd showman, knew that his gift would draw attention not just to the book itself, but to the dramatic tale told within. 1. On the effect colonialism is still having on native populations in Latin America: "The massacres of Indians that began with Columbus never stopped ... The Yaqui Indians of the Mexican state of Sonora were drowned in blood so that their lands, fertile and rich in minerals, could be sold without an unpleasantness to various U.S. capitalists ... On the Andean slopes near Bogota, the Indian peon must still give a day's work without pay to get the hacendado's permission to farm his own plot on moonlit nights." 2. On U.S. aerial photography of Latin America to determine the locations of mineral deposits : "[T]here is a clear link between between the imperative need for strategic minerals, indispensable for the maintenance of U.S.-led military-atomic power, and the massive purchase of land  usually by fraudulent methods  in Brazil's Amazonia ... To justify the U.S. air force's aerophoto excursions, the [Brazilian] government had previously declared it lacked the resources for the job. Again par for the course in Latin America: its resources are always surrendered to imperialism in the name of its lack of resources." 3. On how modern Latin American countries got locked in a cycle that left their economies underdeveloped: "By the middle of the nineteenth century, servicing of foreign debt absorbed almost 40 percent of Brazil's budget, and every country was caught in the same trap. Railroads formed another decisive part of the cage of dependency ... Most of the loans were for financing railroads to bring minerals and foodstuffs to export terminals. The tracks were laid not to connect internal areas one another, but to connect production centers with ports ... thus railroads, so often hailed as forerunners of progress, were an impediment to the formation and development of an internal market." Galeano's book is a well-researched historical account and, while it does include quotes by Karl Marx, a left-leaning perspective does not rob the book of value. It's perhaps overly dense with fact after fact after fact  the author doesn't zoom out often  but the book still makes a convincing argument that Latin America was a victim of European and American exploitation. This is not a difficult case to make when you're talking about colonialism. But with leftist leaders like Chavez and Bolivia's Evo Morales assuming power of 21st century Latin American governments, it's important to understand how they think we got here and who they hold responsible. Therefore, Galeano's 1971 book is still worth reading today. Of course, Chavez's gesture will only succeed if he can refrain from again calling the American president an "ignoramous." And on his end, Obama might want to take a closer look at gifts from now on. After receiving Galeano's tome, he reportedly quipped, "I thought it was one of Chavez's books. I was going to give him one of mine."